Today's manicure utilizes a polish that I was told (by Zoya herself) that I was not allowed to wear, since it clashes with my skin tone. 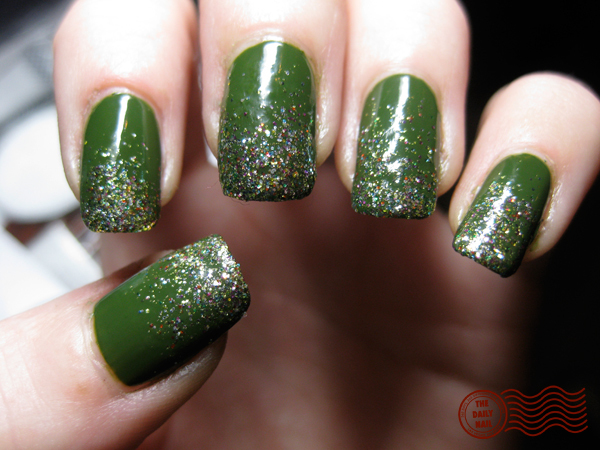 :-P I love this polish too much to let something like skin tone get in the way of wearing it! I wanted something simple today, for more than one reason... I fell asleep on the couch last night, which ALWAYS gives me a horrible 'crick in the neck' that lasts for a week or more, and the second reason was that I was in a hurry to get across town. Sorry for no post yesterday, I passed out on the couch after work and woke up this morning- gotta love having to work the day after midnight movie showings. :-P I got 3 hours of sleep. AWESOME. 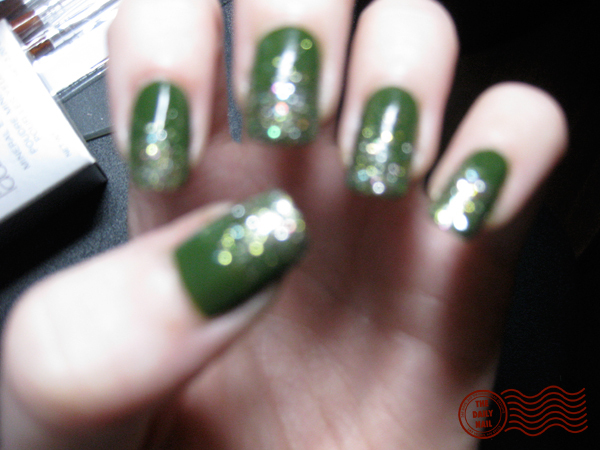 Anyway, to the manicure, I used one of the new OPI Burlesque glitters, ack!! THey're so sparkly. This pic doesn't show any of the glitz! (even though I added a blurry pic to sort of show the sparkle!) Also, ignore the middle finger, I broke it, and I had to mend it, so it's wonky looking. I used Zoya Shawn as a base, with OPI Glow Up Already sponged on the tip. Topped it off with 2 coats of Seche Vite Top Coat. I love that Zoya color! Let's go to the mall is my favourite HIMYM song! How's your beaver? Haha. it's such a weird color but i love it especially with the sparkles! Haha, LOVE the title of this one!! I myself am a pale red head, and I always thought that dark greens like that look pretty good with the red hair. How do you mend a broken nail? I keep having to chop mine off when they break because I can't find a decent fix.. I really don't think it clashes with your skin tone at all! Love the look! I totally wouldn't have noticed your middle finger if you hadn't mentioned it! This is really great, and I don't think it clashes with your skin either. Hi-Love your web blog! Love the green color with the sparkles, perfect for Christmas parties, LOL 3 Hours of Sleep, what movie did you see? Hope your neck feels better today, I think you entitled to a neck massage...I agree with Zara, I don't think this color clashes with your skin tone. What matters is that you love the color! Nameste. LOVE LOVE LOVE Shawn! I just got it yesterday AT MY LOCAL ULTA!!!!! I didn't know Ulta was going to carry Zoya, and am SO insanely happy. I got Edyta and Kelly, too. Quite pleased that Ulta has awakened to the real world, and gotten some more interesting brands and colors... it's about time! Love these nails. There is something about a glitter gradient that is super appealing to me. Bling? Don't mind if I do! And I really like Shawn on you! I love this and it's so easy!! I did it with OPI Aragon Tomorrow and OPI Glow It Up Already. What a fun holiday look! I'm going to try it with reds next. Thanks for the idea.